ATTENTION: This information is based on the latest Add-on version. Maybe your installed version didn't contain all the variables listed here, please refer add-on help for further details! From 0.9.3 and onward we have a new logic of our Variables, please use the NEW ones from now instead of the OLD ones! TIP: Some variables cannot be used when composing new mails; a message will be displayed should you chose one accidentally. ATTENTION: Sections inside square brackets [[Cc: %cc(name)%]] will only be displayed if the variable %cc(name)% can be found in the header and replaced successfully! Example: To: Alex Cc: Fred - if Cc is missing, everything within the brackets will be omitted. By Default you can place the Signature by Account Settings in Thunderbird. and remove the Signature delimiters '--' by our Global settings Tab. But with follow variables you can override this positioning and use the variable with or without the delimiters. By Default, Date/Time variables will always be initialized with current values (current = the time when you create the email). When combined with %X:=sent%, the date/time variables will reflect the original messages date/time. %deleteText("text")% = Remove some text from the Quote Header, such as deleteText("via Paypal")- "John via Paypal wrote" => "John wrote"
%replaceText("find","replace")% = Replace some text with something else (similar to deleteText). %matchTextFromBody("Regular Expression",MatchGroup)% = Finds a pattern in quoted Email and insert at function location. %matchTextFromSubject("Regular Expression",MatchGroup)% = Finds a pattern in subject and insert at function location. Note: the new %matchTextFromBody% and %matchTextFromSubject% functions use regular expressions - these are powerful keys for finding text patterns. The first parameter must be the regular expression within double quotes. The second parameter is a number which denotes the "match group". Match groups are usually designated with round parentheses (). Use 0 to match the complete expression, 1 for the first group etc. 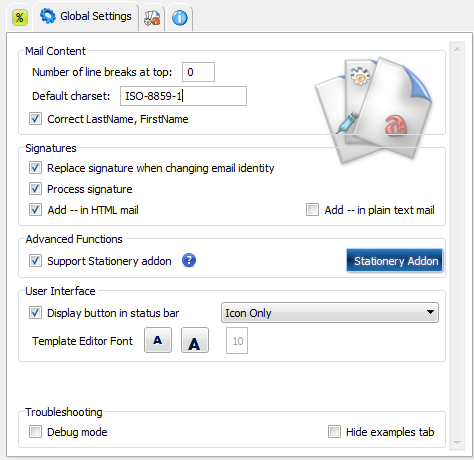 The following functions can be used to modify header fields such as the "To:" line of the email so that the Email is autopmatically sent to a different recipient. They are included in SmartTemplate⁴ Pro for unlimited use. Read up on the full functionality on the premium features page. These functions can be used to extract matching text (e.g. Names or email addresses) from the E-Mails replied to and then modify fields like To, Cc, subject. They are documented on the premium features page. The %file()% functions can be used for inserting images or HTML / text files which can even contain more SmartTemplate⁴ variables. They are included in SmartTemplate⁴ Pro for unlimited use. Read up on the full functionality on the premium features page. and Templates without the <br> Tags included should be used WITH the option "Replace new-line with <br>" activated! ATTENTION: Please use only UTF-8 (Unicode) charset inside HTML templates! A UTF-8 encoding table can be found here.